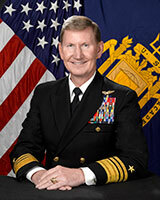 Vice Admiral Walter E. “Ted” Carter Jr became the 62nd superintendent of the U.S. Naval Academy on July 23, 2014. He graduated from the U.S. Naval Academy in 1981, was designated a Naval Flight Officer in 1982, and graduated from the Navy Fighter Weapons School, Top Gun, in 1985. He completed the Air Command and Staff College course and the Armed Forces Staff College. In 2001, he completed the Navy’s Nuclear Power Program. Carter’s career as an aviator includes extensive time at sea, deploying around the globe in the F-4 Phantom II and the F-14 Tomcat. He has landed on 19 different aircraft carriers, to include all 10 of the Nimitz Class carriers. Carter commanded the VF-14 “Tophatters,” served as Executive Officer of USS Harry S. Truman (CVN 75), and commanded both USS Camden (AOE 2) and USS Carl Vinson (CVN 70). His most recent Fleet command assignment was Commander, Enterprise Carrier Strike Group (CSG-12) during Big E’s final combat deployment as a 51 year old aircraft carrier in 2012. Ashore, Carter served as Chief of Staff for Fighter Wing Pacific and Executive Assistant to the Deputy Commander, U.S. Central Command. He served as Commander, Joint Enabling Capabilities Command and subsequently as lead for the Transition Planning Team during the disestablishment of U.S. Joint Forces Command in 2011. After leading Task Force RESILIENT (a study in suicide related behaviors), he established the 21st Century Sailor Office (OPNAV N17) as its first Director in 2013. Most recently, Carter served as the 54th president of the U.S. Naval War College. During his tenure, he established the Naval Leadership and Ethics Center in Newport, R.I., on May 1, 2014. Carter is the recipient of various personal awards, including the Distinguished Service Medal, Defense Superior Service Medal (two awards), Legion of Merit (three awards), Distinguished Flying Cross with Combat V, Bronze Star, Air Medal (two with Combat V and five strike/flight), and Navy and Marine Corps Commendation Medal (two with Combat V). He was awarded the Vice Admiral James Bond Stockdale Leadership Award and the U.S. Navy League’s John Paul Jones Award for Inspirational Leadership. Carter was also appointed an Honorary Master Chief by the Master Chief Petty Officer of the Navy in 2008. Carter flew 125 combat missions in support of joint operations in Bosnia, Kosovo, Kuwait, Iraq and Afghanistan. He accumulated 6,150 flight hours in F-4, F-14, and F-18 aircraft during his career and safely completed 2,016 carrier-arrested landings, the record among all active and retired U.S. Naval Aviation designators. In April of 2015, Carter was inducted into the prestigious Rhode Island Heritage Hall of Fame.